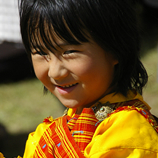 The people of Bhutan can be divided into three main ethnic groups: The Sharchops, who live in the east of the country and are believed to be the original inhabitants. The Ngalongs, who live mostly in western Bhutan and are the descendants of Tibetan immigrants who arrived in Bhutan from the 9th century. The Lhotshampa, who are of Nepalese origin and settled in the south of Bhutan in the late 19th century. 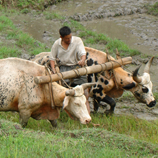 The Lhotshampa (meaning Southern Bhutanese) represent Nepali- speaking groups. Bhutan has the richest and one of the world’s finest cultural heritages that has largely remained intact due to its isolation from the rest of the world untill early 1960s. One of the main attractions of the tourists in Bhutan is culture and its traditions, the government is increasingly making efforts to sustain the current culture and tradition and Bhutan has aptly been referred to as the ‘Last Shangri-la’. Bhutanese art reflects major Tibetan influences, though it has developed many of its own derivations. It has three main characteristics: it is anonymous, religious, and performs no independent aesthetic function. Intricate wall paintings and thankas (wall hangings), most historical writing and fine sculpted images all have a religious theme. Although both Buddhism and the monarchy are critical elements, it is the general extensive perpetuation of tradition that is possibly the most striking aspect of Bhutan 's culture. This is most overtly reflected in the style of dress and architecture. 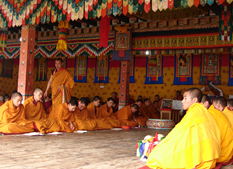 All Bhutanese continue to wear the traditional dress: the gho, are knee-length dress, for men and ankle-length dress which clipped at shoulders and tied at the waist, the kira for women. An accompaniment to the kira is a long-sleeved blouse, the toego, which is worn underneath an outer layer. Generally colorful apparel, the fabrics used range from simple cotton checks and stripes to the most intricate designs in woven silk. Hand-woven fabrics are the pride of Bhutan and well remind textile-lovers of weavings form Laos, form Northeastern India or form the Central America and Peru . The Bhutanese architectural landscape is made up of chortens, stonewalls, temples, monasteries, fortresses, mansions and houses. Associated with a number of clear-cut architectural concepts and building types rooted in Tibetan Buddhism, there is a strong association between state, religious and secular forms. What makes it quite unique is the degree of uniformity, with all structures corresponding to traditional designs. Thus ancient monasteries and fortresses appear to merge with more modern popular dwellings to create a setting that is fully internally consistent. Rice and maize are the staple foods of the country. The diet includes chickens,yaks,cows and sheep. chilli with cheese is the favorite dish. Popular beverages include butter tea, locally brewed rice wine and beer. Bhutan is the only country in the world to have banned the sale of tobacco. 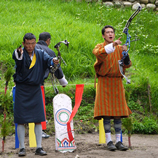 Bhutan ’s national sport is archery, and competitions are held regularly in most villages and towns. Unlike in Olympics the standards differs in the technical details such as placement of the targets. There are two targets placed over 100 meters apart and teams shoot from one end of the field to the other, with each member of the team shooting two arrows per round. Archery is a social event and competitions are organized between villages, towns and amateur teams with plenty of food and drink complete with singing and dancing. 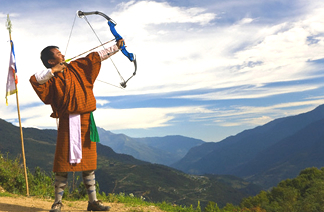 Darts (Khuru) is an equally popular outdoor sport, in which heavy wooden darts pointed nail are thrown at a paperback sized targets about 20 meters away Bhutan has numerous public holidays, most of which centre around traditional seasonal, secular and religious festivals. They include the winter solstice, the lunar New Year, the King’s birthday and the anniversary of his coronation, the official start of the monsoon season, National day and various Buddhist and Hindu celebrations. Even the secular holidays have religious overtones, including religious dances and prayers for blessing the day. Mask dances and dance dramas are common traditional features at festivals, usually accompanied by traditional music. Energetic dancers, wearing colourful wooden or composition face masks and stylized costumes, caricatures a common people. The dancers preserve ancient folk and religious customs and perpetuate the ancient lore and art of mask-dancing. Inheritance in Bhutan generally goes in the female rather than the male line. Daughters will inherit their parents’ house. A man is expected to make his own way in the world and often moves to his wife’s home. Love marriages are the norm. There is no tradition of arranged marriages and though uncommon, polygamy and polyandry are accepted. This is often a device to keep property in a contained family unit rather than dispersing it. Former King Jigme Singye Wangchuck is married to four sisters. In a response to accusations in 1987 by a journalist from UK's Financial Times that the pace of development in Bhutan was slow, the King said that "Gross National Happiness is more important than Gross National Product." This statement appears to have presaged recent findings by western economic psychologists, including 2002 Nobel Laureate Daniel Kahneman, that question the link between levels of income and happiness. The statement signaled his commitment to building an economy that is appropriate for Bhutan's unique culture, based on Buddhist spiritual values, and has served as a unifying vision for the economy. In addition, the policy seems to be reaping the desired results: in a recent survey organized by the University of Leicester in the UK, Bhutan was ranked as the planet's 8th happiest place.